"Maoists did not just tear up ballot papers, but attacked democracy as well." Mayors recently elected to four of Nepal’s six metropolitan cities have already begun work. But Birganj does not yet have a mayor because it is in Province 2, where elections have been postponed twice and are now scheduled for September. Bharatpur in Province 3 had elections in the first phase of polls in May, but the results are not out yet because the Maoist-Centre tore up a few ballot papers to disrupt the results when they found out their mayoral candidate was trailing behind the UML’s. For now, it looks like Province 2 elections may be held before the dispute over the Bharatpur ballot counting is settled. This week, the Supreme Court postponed its decision for the sixth time. After the ballots were damaged on the night of 28 May, the opposition UML asked the Election Commission (EC) to consider those votes invalid, resume counting the remaining ballots and declare the winners. But the EC, apparently under pressure from the ruling Maoist-NC coalition, decided to re-conduct elections in Ward 19 of Bharatpur. The torn votes were from this NC-dominated ward, and the Maoists were disappointed that they could not overtake the UML even when only 900 of 2,700 votes remained to be counted. The EC’s decision was immediately challenged at the Supreme Court by two petitioners, but the decision has been postponed over and over again. Speaking to eye-witnesses present at the counting station close to midnight on 28 May, a picture emerges of a deliberate attempt by Maoist cadre to sabotage the polls when it looked certain that their candidate, Maoist Chairman Puspha Kamal Dahal’s daughter, Renu, was headed for defeat by the UML’s Devi Prasad Gyawali. The counting was nearing the end two weeks after people of Bharatpur voted in the first phase of elections. At around 11:45 pm, Maoist cadre Madhu Neupane began to thump the table as a signal to others, and another Maoist cadre, Drona Siwakoti, followed suit. They then leaped over the table, and began tearing up ballot papers. Police swiftly swung into action, and detained the two Maoists. However, they were just the decoy and as the two were taken away, other Maoists, including Standing Committee member Surya Subedi and Politburo Member Ghanshyam Dahal (Abinash), began tearing up more ballot papers. 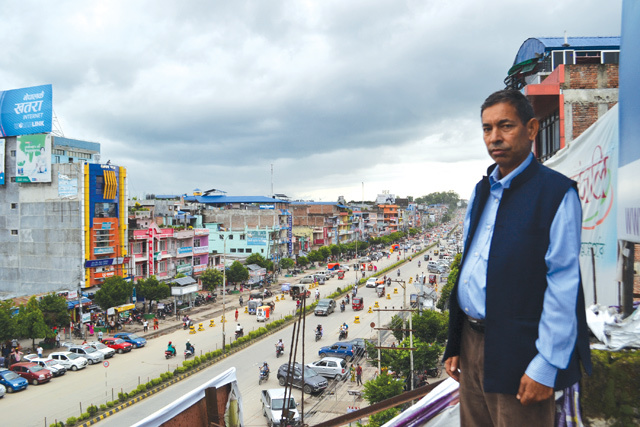 One evening last week, under ominous looking monsoon clouds, Devi Prasad Gyawali appeared surprisingly composed as he surveyed the city that he has not been allowed to lead (pictured, above). As a visiting reporter asked him questions, he answered with a few of his own: Why is the Supreme Court taking so long to decide an open-and-shut case? Why were Maoist cadres Drona Shiwakoti and Madhu Neupane released on bail? Why was the police officer who arrested them transferred out of Bharatpur? Does being the daughter of Maoist Chair Pushpa Kamal Dahal mean that Renu Dahal can do anything she wants? Dahal was still Prime Minister when the Baharatpur ballot-tearing happened. The then-PM had earlier persuaded Sher Bahadur Deuba to have the NC’s own mayoral candidate, Dinesh Koirala, to withdraw in favour of Renu Dahal. The NC could have easily won Bharatpur, but Deuba’s decision to partner with the Maoists helped Gyawali’s campaign. When he was still Prime Minister, Dahal even flew to Bharatpur with Deuba to campaign jointly for her. This enraged Congress supporters, who voted en masse for the UML. Gyawali was leading the race by 784 votes when the ballot-tearing happened. The Maoists were hoping to overtake the UML with a 500-vote margin after Ward 19 was counted, and seal their victory with the results from their stronghold of Ward 20. When that did not happen, they took a two-hour break, called top leaders on the phone, probably including the party hierarchy in Kathmandu, and took the decision to tear up the ballot papers.